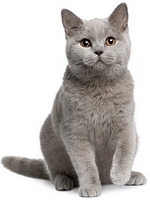 British Shorthairs make wonderful lifelong companions, and are the ideal choice for a house cat. They gravitate towards the comforts of home and hearth, quietly embracing family life, while making a decorative, dignified, and much loved member of the household. British Shorthair are placid, non demanding, tolerant, docile and respectful. They are not vocal cats and, in fact, are very quiet and can cope with being alone without fretting. They are not inclined to wander. They love children, and get along extremely well with other cats and dogs. The British Shorthair is bred in over one hundred color and coat pattern combinations, although some colors are not readily available. 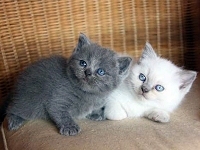 Innocentia Cattery focuses on the Blue British Shorthair and the White British Shorthair. The Blue British Shorthair is an amazingly beautiful feline. The snowy White British Shorthair, with its striking copper colored eyes, is a rare color to find, and we are exceptionally proud to produce them! With short, dense coats British Shorthairs are teddy bear soft! In fact, their soft velvety coat is reported to sport more fur per square inch than any other cat breed. They shed very little, and easily look after themselves, but we recommend occasional assistance with grooming. British Shorthairs have a unique history. When the Romans invaded Britain, they brought cats along, to help protect their food supplies from rodents. Eventually, the Romans left, but the cats remained behind, conquering a country with only their charm. As often happens during times of great conflict, the population of the British Shorthair was severely diminished during WWI. This was to repeat itself with the occasion of WWII, with the remaining numbers of Shorthairs even more dire than before. To save it from extinction, through careful selection, breeders crossed it with other breeds, such as the Russian Blue, Chartreux, and Persian. The beloved British Shorthair was back into the British home, now with a teddy bear look, a stout body, full whisker pads, a naturally upturned mouth, and round, wide-open eyes. The same mild disposition the breed had been esteemed for remained, and the luxurious coat of fur inherited greater softness from the carefully chosen crossings. This extraordinary cat became so entwined in British life, with its "smile" so well known, that it inspired perhaps the most famously recognized illustrated image of a cat to this day, when John Tenniel designed the Cheshire Cat for Lewis Carroll's "Alice's Adventures in Wonderland" in 1865. 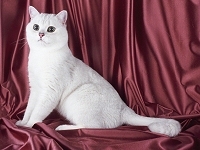 The British Shorthair holds the historical placard for being the first official showcat, and is the antecedent of the modern breeding program. 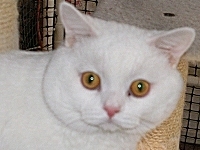 To see more photos of gorgeous British Shorthairs, visit our British Shorthair Photo Gallery page!